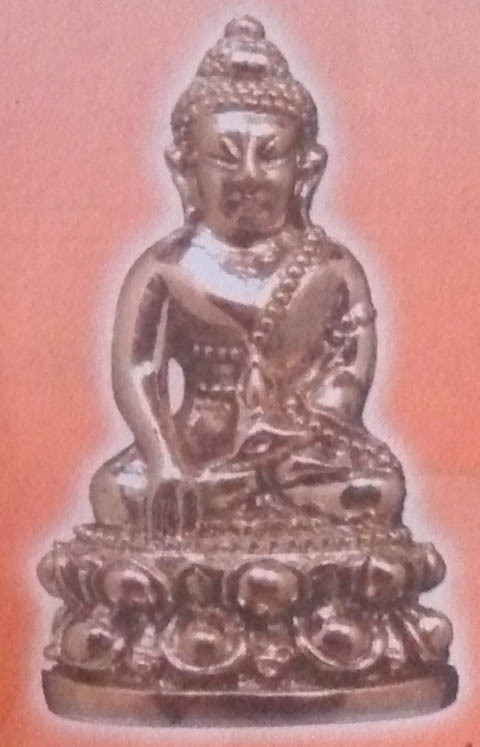 Ajarn Nam blessed and empowered the Pra Gring Bua Rorp (run Burana Sala edition) amulets. Luang Phu Nam (89 years old), famous Master Monk of Supannburi province, is the Abbot of Wat Noi Chompoo, in ‘Ban Grang’ (the home of the original Famous Pra Khun Phaen Ban Grang amulet). The amulets were made to raise funds for improving the Sala Bprian at the temple of Wat Kae to make it a two storey building, for it is no longer large enough. Above amulet is made from Nuea Tong Tip – 2.2cm x 3.2cm – 2999 amulets made. Above amulet is made from Nuea Navaloha 2.2cm x 3.2cm – 1999 amulets made. 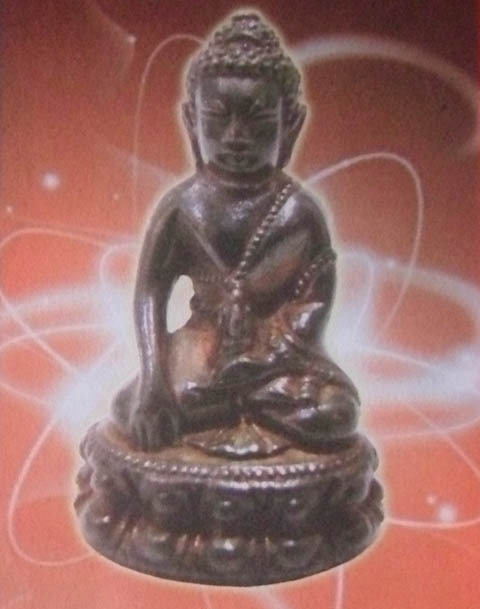 Above pic; Luang Phu Nam meditating to enter Jhana for empowering the amulets. two pics right; Lighting the Tian Vipassee and the Tian Novahorakun (ritual candles), for the Puttapisek Ceremony. Above; Continuing the lineage of Pra Kring amulet metal – old editions of various Pra Kring amulets are smelted together and joined with the new mixture, in continuous lineage. You can see the ‘Sai Sinjana’ cords in the hands of the monks as they pray and chant to transmit the continuation of lineage of magic power instilled within the Pra Kring amulets. Above; The Sala Bprian which is in process of refurbishing and extension. Funds from the amulets will finance thie completion of the construction. Below; The Ceremony to smelt and mold the Pra Kring amulets was held at the Don Chedi monument. Above; Pra Taep Suwanna Molee (head monk of Supannburi province) heads the opening ceremony of pouring the gold into the Pra Kring The pouring of the first smelting is a grand ceremony and important part of the magical formula of Pra Kring amulets. Metal from old Pra Kring Khun Phaen amulets, Pra Kring U-Tong, Pra Kring Naresuan Yuthahadthee, and 108 Yantra inscribed on metal leaves amulets, and metals from many ‘Gaan Chor Pra Kring’ (treelike frame which the amulets are molded on) from various editions of Pra Kring. These metals were then smelted together in the sacred smelting ceremony to make new sacred Pra Kring. This is part of how original authentic Pra Kring amulets continue their lineage (bloodline) by using remnants of previous Pra Kring to smelt into the new amulets. 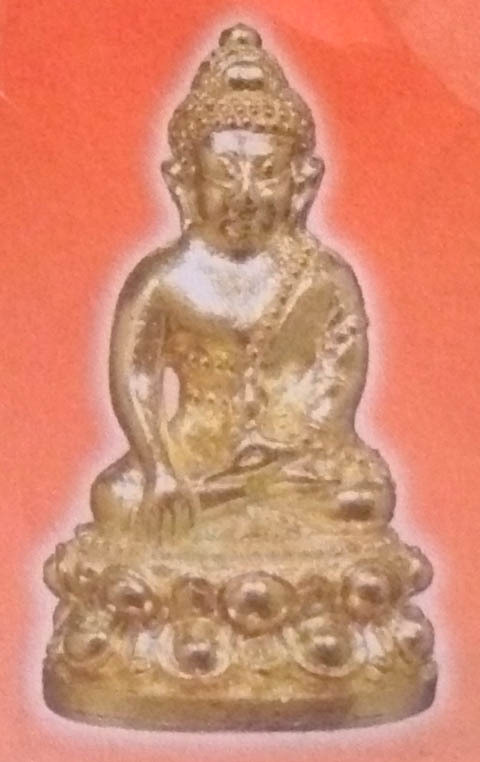 Luang Phu Nam was also inviloved in the Puttapisek for KHun Phane Sao Ha amulets made at Wat Kae in Supannburi.